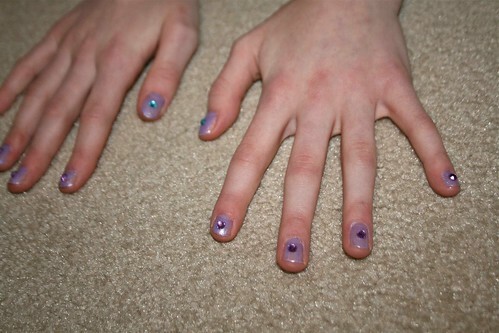 One of Mattey's favorite pass times lately is to do her nails. She redid them tonight and added a little bling. About once a month I make her clean off the counter in the kids' bathroom because she gets polish on it. (I can't even count how many times I've told her to put something under her hands, like a piece of paper, when she paints her nails.) Thankfully it comes off or we'd have one colorful countertop.